Now in paperback, Ron Clark's New York Times bestseller that's changing America one child at a time! The runaway bestseller that's a must-have for every parent and teacher. How many authors would travel coast to coast on a bus to get their book into as many hands as possible? Not many. 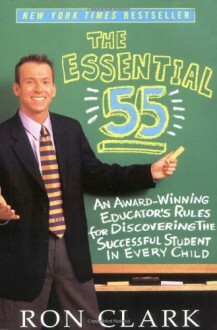 But that's just what Ron Clark, author of The Essential 55, did to keep his book and message in the public eye. And it worked. After his Oprah appearance, sales skyrocketed: we've sold more than 850,000 copies in six months! The book sat tenaciously on the New York Times bestseller list for 11 weeks. Ron Clark was featured on the Today show, and in the Chicago Tribune, Good Housekeeping, and the New York Daily News -- not to mention the calls we've received from teachers and parents who want to get their hands on Ron's guidelines for teaching children. Now in paperback, The Essential 55 will be the perfect book for parents and teachers to slip into their own backpacks, to read on the train or at lunch, and to highlight the sections that resonate for them. And with an author who is truly a partner in getting his message to the masses, we just can't lose.